If you are looking for something for your family to do on a free night, have you ever considered watching knights joust for the hand of a fair maiden? Evil wizards trying to bring down the King’s reign? A feast made for kings? If this sounds like the kind of excitement you are looking for, then you need to go to Medieval Times Dinner and Tournament. 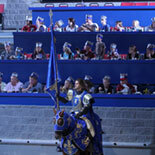 Whether it is just you and your significant other, or all of the kids, there are few better times to be had than watching a story of knights and legends performed before your very eyes. You will drink and eat in a manner similar to the men and women of the day, and cheer for your representative knight. Every section of the arena is decked out in the colors of one of the seven knights of the land, and they are yours to cheer and push to win. The food is spectacular, including a four course meal that includes cornish hen, soup, and a side. No forks or knives means that you will be grabbing your chicken leg and raising it to the sky, cheering for your knight to down his opponent. The more you get into the revelry of the entire experience, the more fun you are going to have. Don’t feel bad about screaming for your knight, giving a mighty ‘HUZZAH’ for when he takes down one of the other bannered men. When we went, we got our tickets from https://www.trustedtours.com/store/medieval-times-dinner-tournament-georgia.aspx and found a nice discount to make it a little cheaper, and I highly recommend you do the same. Enjoy the fighting, the horsemanship, and perhaps even stay afterwards for the party, but whatever you do, you are guaranteed the time of your life.